Back to School Facials - Blast Away Acne for Confident School Comebacks! Get a June Jacob's Facial! Kids are ruthless. I know my son suffered deeply from acne during his high school years, and even his closest "friends" made him feel insecure about his re-occurring acne outbreaks. We tried everything to help his acne prone skin, and soon learned that professional facials helped tremendously. As his skin became clearer, his confidence and even his grades became better! 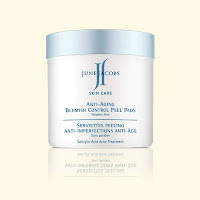 So I was extremely excited when earlier this month we received the new June Jacobs Blemish Control line. 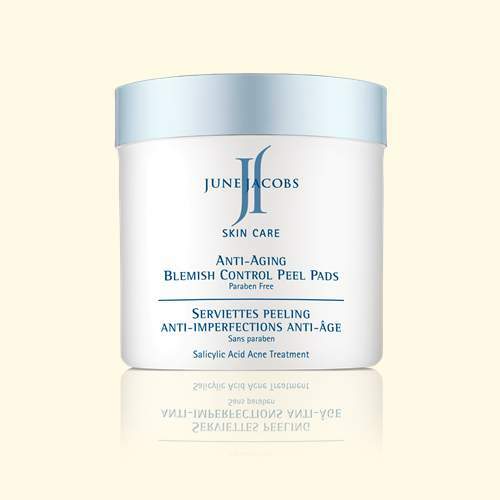 June Jacob's is one of my favorite lines here at Pure Spa Direct. Her integral line of products is loved by estheticians and five star spas because they truly perform! What is also exciting about the new Blemish Control line is that the products are targeting hormonal acne outbreaks. Catering to skin care needs affected by stress and hormone levels, this paraben and preservative free collection of products helps to combat acne and calm skin. This means it's even great for clients suffering from adult acne - like me. Paraben free anti-aging peel pads with 2% salicylic acid treat existing blackheads and blemishes and help prevent new acne from forming. Alpha hydroxy acids work synergistically with a concentrated blend of broccoli, blue daisy and willow bark extracts and tea tree oil to help promote cell turnover, detoxify problematic skin, soothe irritated skin, and helps to absorb oil and clarify congested pores while thoroughly cleansing the skin. Preservative free lightweight lotion with salicylic acid reduces blackheads and blemishes while humectants help to maintain skin’s natural moisture balance for a healthy matte finish. Effective combination of blue daisy, broccoli and turmeric extracts help to calm, soothe and detoxify problematic skin, reduce the appearance of fine lines and wrinkles and improve skin vitality and tone. Fast acting paraben and preservative free spot treatment with salicylic acid clears and prevents blemishes while blue daisy, arnica and chamomile extracts help to calm, soothe and reduce skin redness. Broccoli extract detoxifies problematic skin and helps to reduce the appearance of fine lines and wrinkles, while turmeric extract helps to improve skin radiance and tone. Powerful patent pending anti-oxidant blend of white, red and green tea extracts combined with goji berry, pomegranate and grape seed extracts help to neutralize free radicals, protect skin from environmental toxins and combat the visible signs of premature aging. For more information about purchasing June Jacob's products at wholesale for your Day Spa, call us 800.434.0018 or visit our website. Licensed Professional ONLY.